A week tomorrow, I will be releasing the debut Severed Fifth album Denied By Reign. 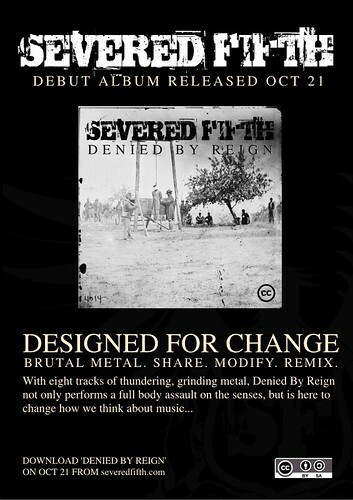 October 21st, head over to severedfifth.com and grab it. Also, based upon feedback, I will be releasing the entire album under a Creative Commons Attribution ShareAlike license. Congrats man! I think it’s really cool you released under CC license. I am looking forward to give it a listen. I’ll stay tuned. You going to put it on jamendo.com so I can listen to it directly with rhythmbox and amarok? Good to see you changed your mind about the license. Would be cool if you could write down what changed your mind so other people dealing with the same questions can get an insight in your decision making process. Awesome! So glad you changed the license. I think this makes this a much more exciting project. Awesome, and this related to Ubuntu how? I have to second the notion about putting it on Jamendo. Maybe also look into magnatune, cdbaby, and tunecore?